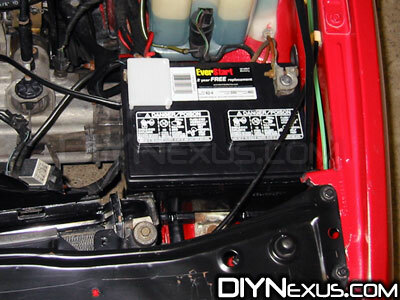 This DIY will explain the benefits and procedure for replacing the battery with a lighter model on a MKII Golf, Jetta or GTI. Lighter batteries are all the rage these days. The concept is a really good one; if you can get a smaller/lighter battery that will fit correctly and still start the car, you’ll improve performance and economy. Less weight means faster acceleration, better braking and better handling. It also translates into an improvement in fuel economy and a reduction of wear on brakes and other components. 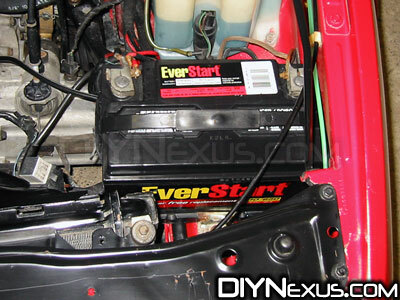 Its smaller size makes it easier to install and opens up some space in the engine bay. Most US-spec MK2 cars came equipped with a battery with a size code of ’41’. This battery usually weighs between 37 and 45 lbs. While doing research on the available options to go lighter, I got frustrated because none of the expensive racing batteries are a really nice ‘direct-fit’ replacement. More research showed that on a few US models and many European models they used a size ’42’ standard battery. This battery weighs-in between 29 and 32 lbs. It’s also a perfect ‘direct-fit’ replacement, and it’s cheaper than the normal size ’41’ battery. Note: This smaller battery has a lower Cold Cranking Amp (CCA) rating than the original. This shouldn’t be an issue unless you live in an extremely cold climate. 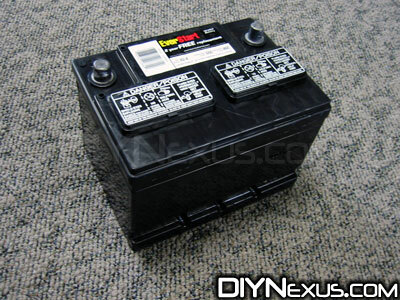 I’ve used a size ’42’ battery on my Corrado VRT for years with no problems. This D.I.Y. references the MK2 Battery Removal guide, and requires the same tools. 1) Have a look at the standard size ’41’ battery in this MK2. It’s large enough that it actually touches the inner fender well on the right side. You’ll need to remove it to install the smaller battery. 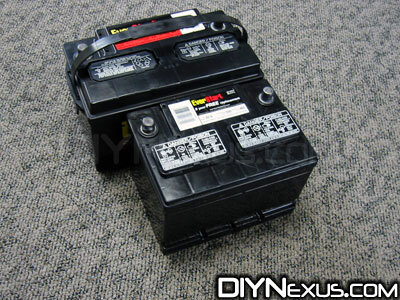 Check out our MK2 Battery Removal guide for instructions and warnings about this procedure. 2) Once removed, here’s a side-by-side comparison of the two; you can really see the difference in size. I checked the weight using a bathroom scale. 🙂 The original battery was 37 lbs and the smaller one is 30 lbs. Your weight savings may actually be greater than mine because my old battery was the lightest size ’41’ I’ve seen. 3) Here’s a shot of the engine bay with the new battery installed. It uses all the factory mounting hardware, the terminals reach easily, and now there’s room to spare all around it!